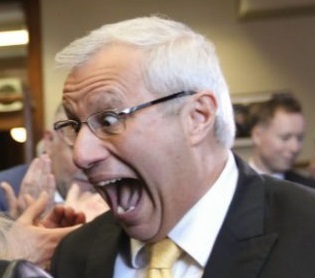 NORTH BAY — Vic Fedeli, the now regular sized interim leader of the Ontario PC Party, loves him some hotdogs. Fedeli, with his trademark yellow tie matched by an equally yellow apron, cooked up an army of weenies Wednesday evening for the first ever Progressive Conservative Hotdog Eating Contest®. Dozens of local North Bay citizens and several key players in the race to be the new PC leader attended the wiener wingding at the Davedi Club. The hotdog eating contest began at 7:00 pm sharp, with nine contestants crushing, smushing, gobbling, scarfing, chewing, chomping and swallowing as many ketchup-soaked franks as they could in fifteen minutes. The ultimate winner was Doug Ford, with a record of 53 hotdogs and buns consumed. As a result, Ford was announced as the new Ontario PC leader. Caroline Mulroney came in second with 24 hotdogs, Christine Elliott third with 21, and Tanya Granic Allen refused to take part because hotdogs look too much likes penises. Patrick Brown, who originally said he’d be attending, did not show up. He was instead spotted at his $2.3-million Lake Simcoe waterfront home with his 23 year old girlfriend Genevieve Gualtieri, who is a former PC intern.